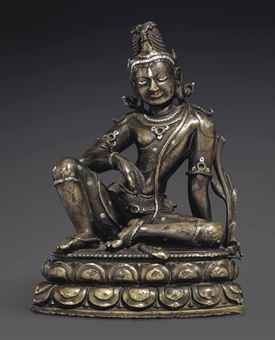 Likewise, this “fine and rare”, silver-and-copper-inlaid bronze figure of (the future Buddha) Maitreya, which was made in India in the (Pala period) twelfth century, was “acquired in Hong Kong in 1987“. Where in “northeast India” was it venerated? It has been associated with a time when pilgrims spread portable icons (particularly bronze sculpture) and texts “throughout the region”, but when and how did it leave India? Judging by Christie’s notes, Christie’s consignors don’t know and Christie’s customers don’t care.